Join us on Thursday, February 21 at 6:30pm for an update on the reintroduction efforts of the ʻAlalā. Through intensive conservation efforts 11 ʻAlalā, the endemic and endangered Hawaiian crow, have survived in native Hawaiian forests for over a year and have been joined by another 10. Rachel Kingsley, the Education and Outreach Associate for The ʻAlalā Project, will provide information about this unique species, an update on the birds that have been reintroduced, as well as plans for future reintroduction efforts of the ʻAlalā. 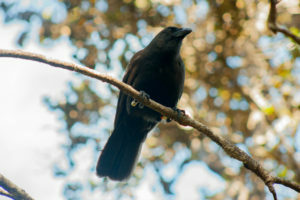 Please join us to learn more about this highly intelligent and unique crow species, integral to native Hawaiian ecosystems and culture.